Dorian is small in scope and is displaying an organized structure. It has an eye like feature. In a similar fashion to Chantal, it is moving quickly. Significant development will be difficult as current and forecast speeds near 20 mph. 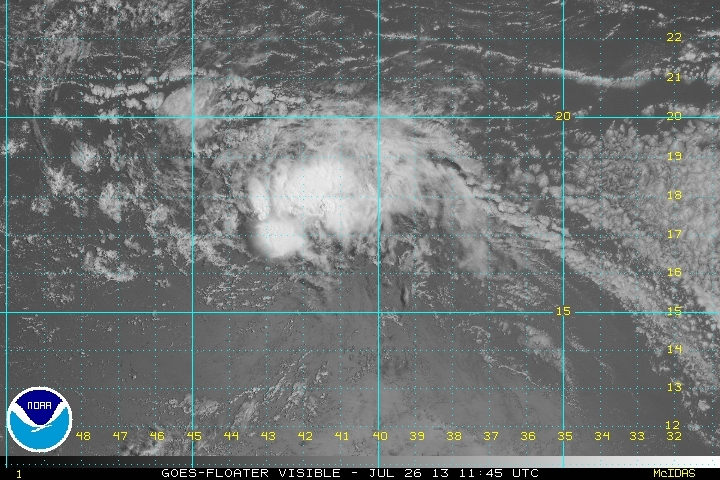 As of 8 am ast (edt) Chantal was centered at 14.3 N / 29.9 W or about 410 miles wsw of the Cape Verde Islands. It was moving west northwest at 21 mph. Top sustained winds estimated at 50 mph (50 mph NHC 11 am advisory). Pressure was estimated at 1002 mb. Forecast models take Dorain generally west northwest across the Atlantic. It should be north of Puerto Rico by Monday. 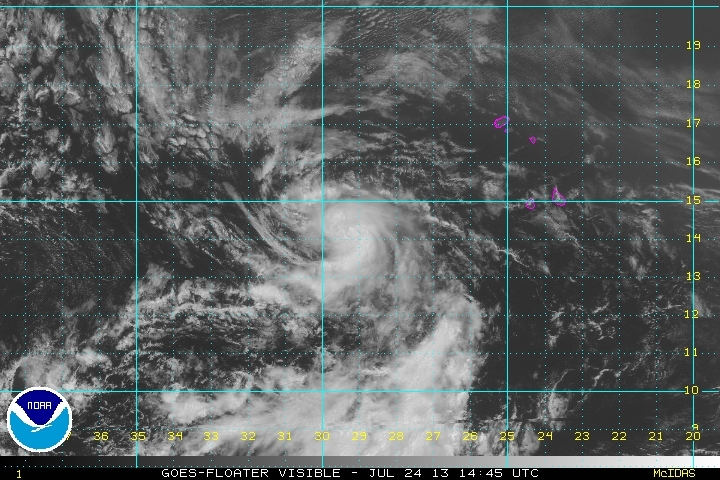 Dorian remains a small tropical cyclone and has slowed down in forward speed. The structure remains well organized with outflow apparent into all quadrants aloft. A deep feeder band has also formed from the deep tropics to the vicinity of Dorian. Satellite intensity estimates are all in the range of 55 knots, so NHC's 60 mph is very reasonable. Dorian will not be a threat to an land locations for several days. The first concern will be the northeast Caribbean in about 3-4 days from today. 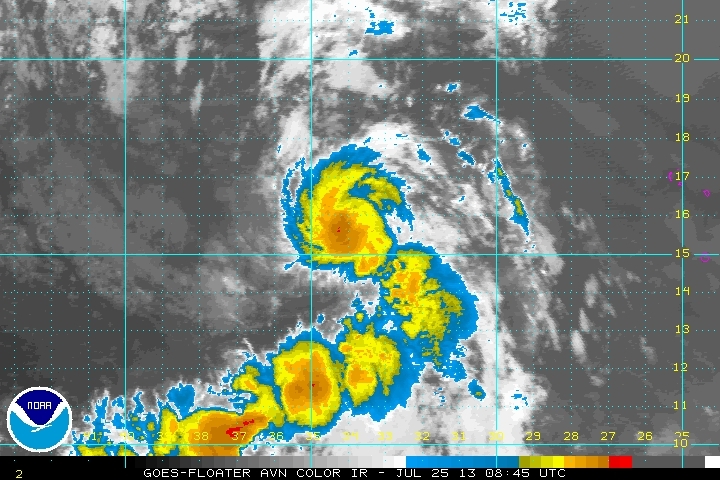 As of 8 am ast (edt) dorian was centered at 15.7 N / 34.7 W or about 740 miles west of the Cape Verde Islands. It was moving west northwest at 17 mph. Top sustained winds estimated at 60 mph (60 mph NHC 5 am advisory). Pressure was estimated at 999 mb. Forecast models take Dorain generally west northwest across the Atlantic. It should be north of Puerto Rico by Monday and possibly near the Bahamas by the middle of next week. Note that this is a long term forecast and subject to error. 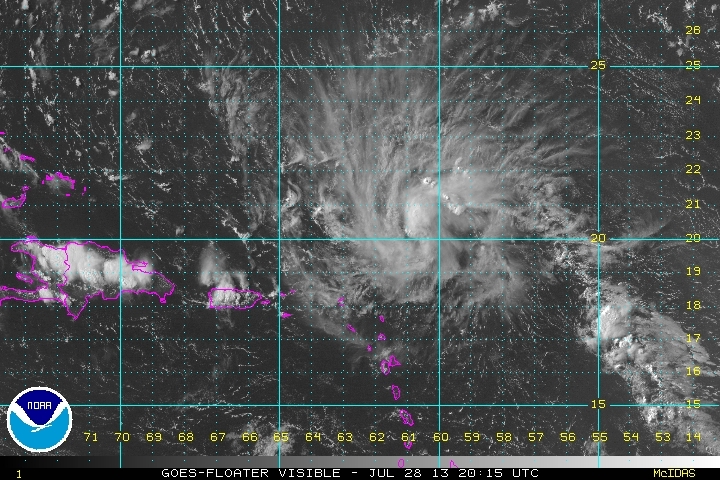 Satellite imagery from Friday morning shows that Dorian is less organized. It has picked up a little forward speed again. Tropical cyclones that have a fast forward speed like Dorian's have a tough time strengthening significantly. The moisture band from equatorial areas is also gone. 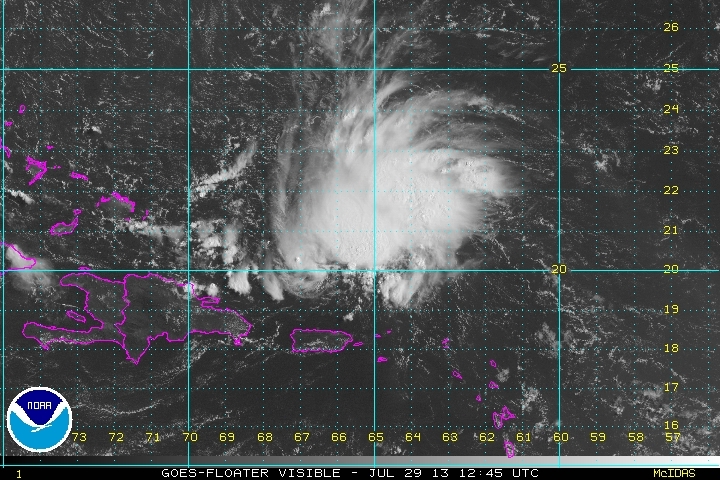 As of 8 am ast (edt) Dorian was centered at 17.2 N / 41.7 W or about 1375 miles east of the northern Leewards. It was moving west northwest at 20 mph. Top sustained winds are estimated at 45 mph (50 mph NHC 5 am advisory). Pressure was estimated at 1001 mb. Forecast models take Dorian generally west northwest across the Atlantic. It should be north of Puerto Rico by Monday and possibly near the Bahamas to Cuba by the middle of next week. Forecast models are in general agreement until Dorian passes near Puerto Rico. After that the current spread is from the central Bahamas southward to Cuba. NHC picked a path in the middle of the models for their official track. Dorian will be fighting wind shear and possibly rugged terrain if it moves on the southern forecast track. This is the reason for NHC not strengthening Dorian to a hurricane. Dorian looks even more disorganized this afternoon. It is likely only a minimal tropical storm at 40 mph. One of the models degrades Dorian into a tropical wave as it moves across the northern Antilles several days from now. 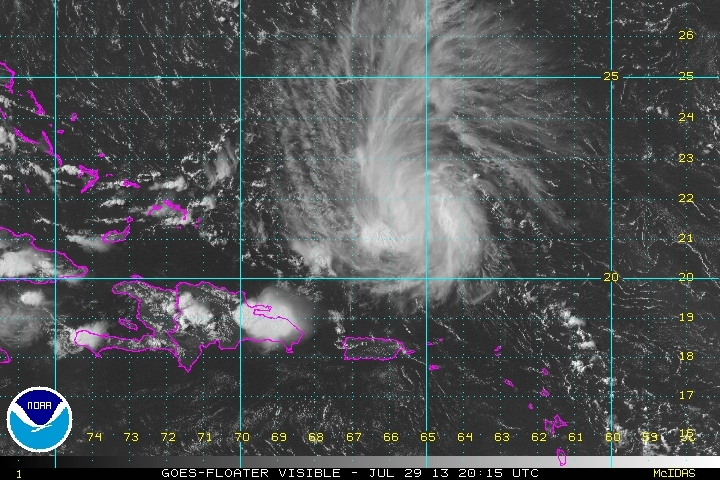 Satellite imagery shows that Dorian is barely hanging on. Some deep convection is near and just west of the center of circulation with the low level center slightly exposed. This indicates wind shear. As mentioned earlier, it is very difficult for a tropical cyclone to develop with a fast motion as Dorian's. 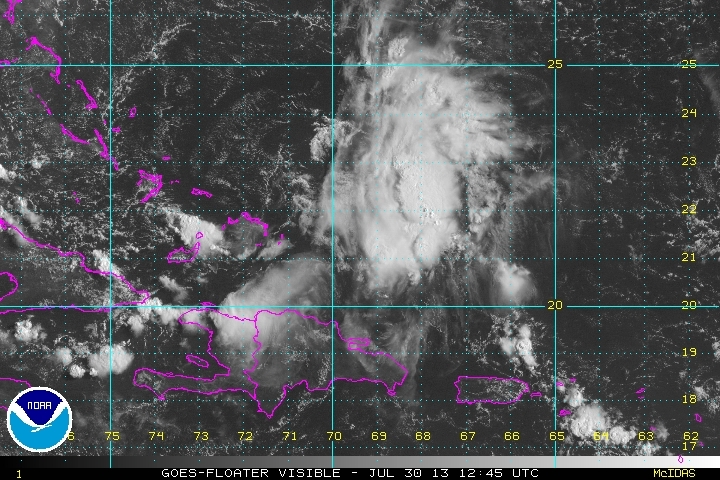 As of 7 am ast (edt) Dorian was centered at 18.2 N / 50.2 W or about 825 miles east of the northern Leewards. It was moving west at 22 mph. Top sustained winds are estimated at 40 mph (40 mph NHC 5 am advisory). Pressure was estimated at 1011 mb. Forecast models take Dorian just north of the northern Antilles from Sunday evening into the middle of next week. It should be close enough to produce an increase in showers and storms as well as a pick up in the winds. It is expected to dissipate during the next 2-3 days. Dorian declassified as of 5 pm edt. The northern Antilles and Bahamas will still likely see an enhancement to showers and storms early to middle of next week. 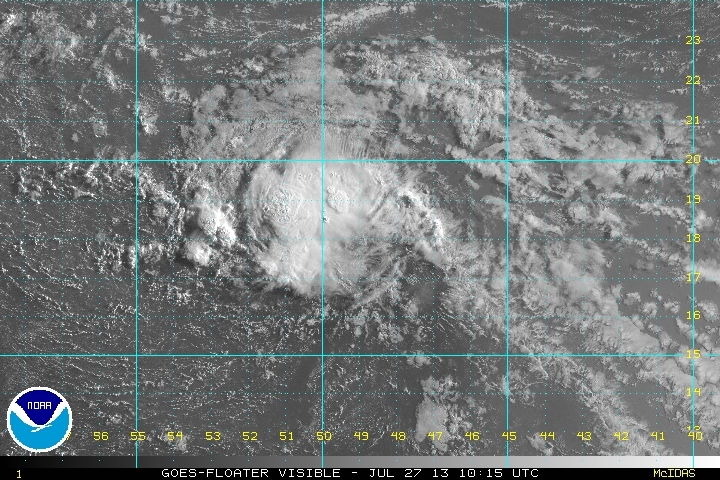 The remnants of Dorian are still hanging around and no doubt causing some uneasy feelings at NHC. A weak low level circulation still seems to be under and area of anticyclonic winds aloft. Deep convection has also picked up a touch. Forecast models take the remnants of Dorian near the northeastern Bahamas by Wednesday. It would be a good idea to continue to follow the progress of Dorian. The remnants of Dorian are improving in structure with deep convection expanding. It is likely that some regeneration is taking place. IMHO NHC will restart advisories. It is currently north of Puerto Rico and east of the Turks and Caicos. The Turks and Caicos and southern Bahamas will see an increase in showers and storms by later tomorrow. Forecast models take the remnants of Dorian near the northeastern Bahamas / SE Florida by Wednesday Thursday. It would be a good idea to continue to follow the progress of Dorian. The remnants of Dorian continue to show organization. The convection isn't quite as strong as this morning, but a more notable spin is present. Forecast models take the remnants of Dorian near the northeastern Bahamas / SE Florida by Wednesday - Thursday. It would be a good idea to continue to follow the progress of Dorian. A broad, weak low level circulation is near the Turks and Caicos. Yesterday's recon did not find a closed circulation. Deep convection is just east of the weak surface trough, so increasing rain chances will be seen over the Bahamas / Turks & Caicos. Deep convection has lingered the last few days over the Bahamas. It was associated with a weak trough of low pressure that was possibly Dorian. There was also a cluster of heavy storms associated with an upper air low nearby. 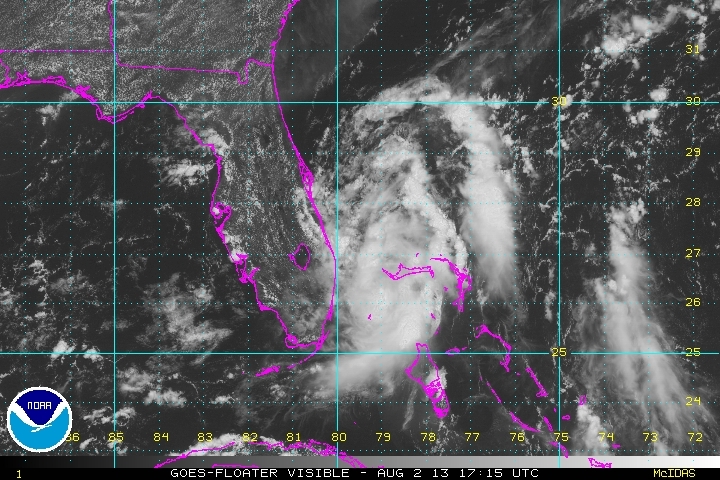 A low pressure area reformed and is very apparent east of Jacksonville Florida. It appears that NHC's early estimate may have been a bit too far south. That estimate was made at 5 am without the aid of visible satellite imagery which can be very difficult. 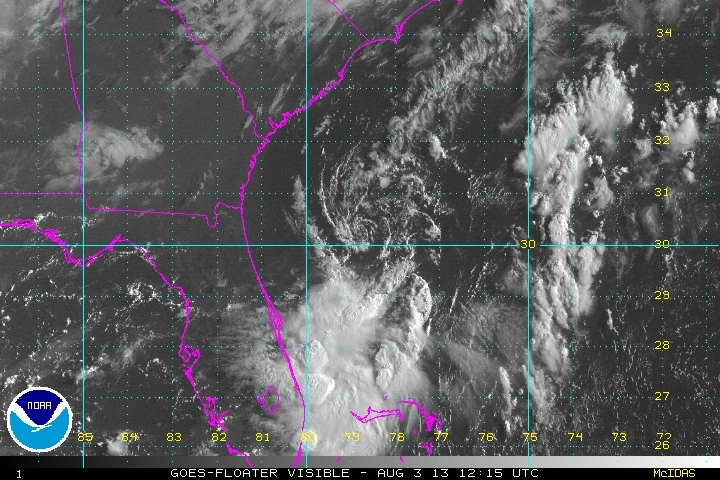 As of 10 am edt Tropical depression Dorian was centered at 30.4 N / 78.6 W or about 170 miles east of Jacksonville, Florida. It was moving ENE at 8 mph. Top sustained winds are estimated at 30 mph (35 mph NHC 5 am advisory). Pressure was estimated at 1013 mb. Forecast models take Dorian east away from the U.S. coast. Dorian was declassified again as of 5 pm. It probably wasn't smart to bring it back this morning. This was probably due to the fact that it was placed closer to the convection than it actually was.